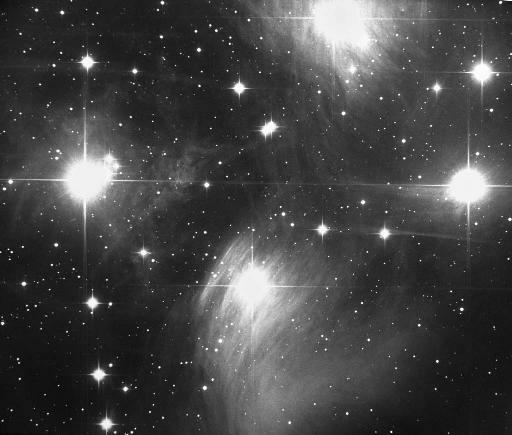 This image of the whole region around the Pleiades open star cluster, M45, illustrates the vast extend of the Pleiades reflection nebula to some distance beyond the cluster. 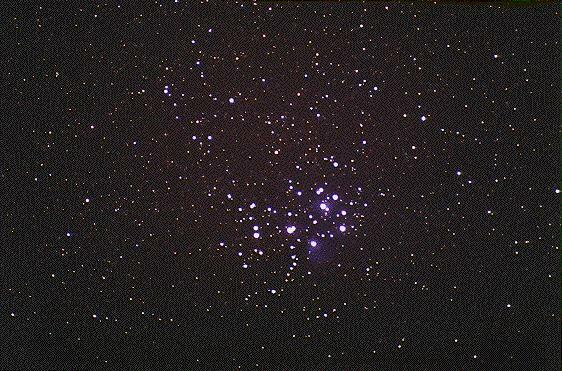 The image was obtained by Matt BenDaniel on October 13, 2001 from Pearce, Arizona with an autoguided Astro-Physics 130 EDF at f/6.7. It is an 78-minutes exposure on unhypered Kodak PPF 400 film. Alexander Jäger of the Interessengemeinschaft Astronomie, the amateur astronomers at the University of Constance, Germany. 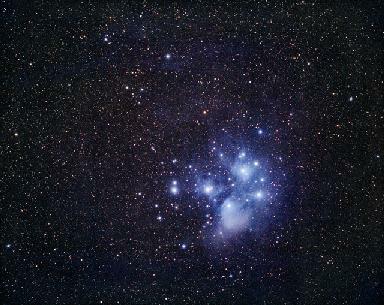 This image was taken with a 300-mm f/2.8 telephoto lens, stopped to f/3.4, and exposed 10 minutes on Scotchchrome 400 film, from Todoque, La Palma, on September 26, 1995, 3:59 UT. 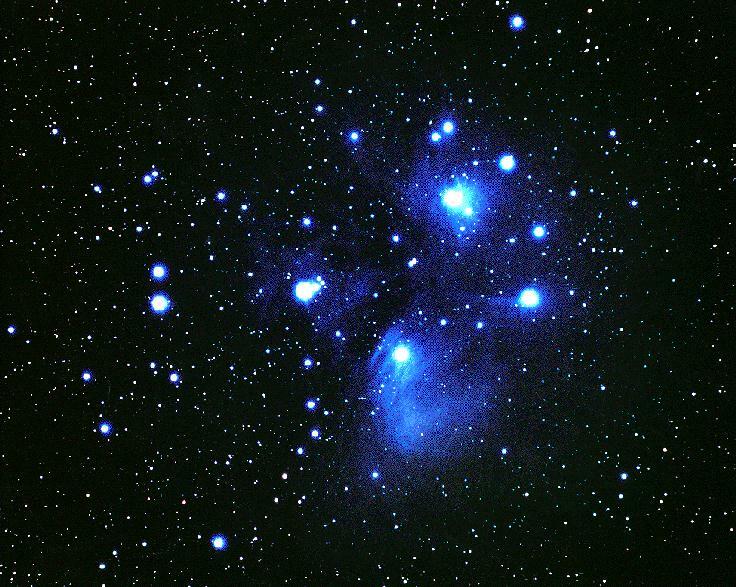 Jason Ware's image of M45, the Pleiades star cluster. 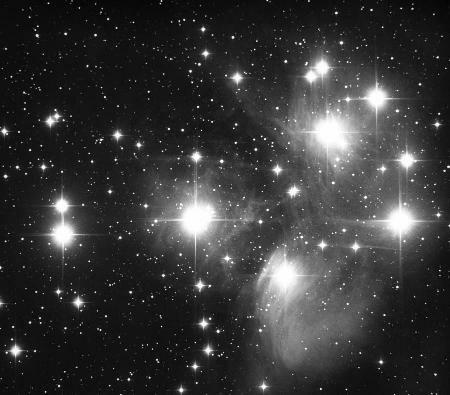 Martin Germano obtained this gorgeous b/w image of open cluster M 45, the Pleiades, with a self-made 14.5 inch f/5 Newtonian telescope, stopped to f/6 (12-inch), and exposed 100 minutes on hypered Kodak Tech Pan 2415 film. A wider view of M 45 (the 'Pleiades'). 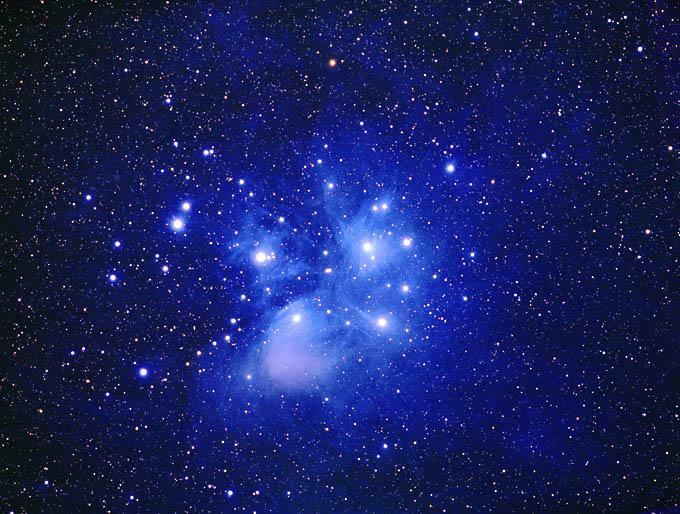 This fine photograph was taken with an 8-inch f/5 Newtonian, stopped to f/6 (6.67 inches), also by Martin Germano. It was exposed 120 minutes on hypered Kodak Tech Pan 2415. George Greaney obtained this great color image of the Pleiades open star cluster and its associated reflection nebulae. This image is a digital composite of four 50-minute exposures on hypered 120 Fuji SHG400. The four original 6X7 negatives were scanned at 2000 dpi using a Polaroid Sprintscan 45. They were then merged using Picture Window 2.0, the resulting composite image was digitally enhanced in Photoshop 5.0.